Lock in a great price for Best Western Alba – rated 8.5 by recent guests! Location was excellent, close to shopping and center. A/c and heater worked perfectly. Staff was really helpful. Location. Location. Location. ❤ very helpful and friendly staff. Great breakfast menu and choices. Close to public transport. Convenient shopping. Walking distance to everything: sights, transport, restaurants, shopping. The room at the Best Western Alba was more spacious than we expected. The bed was very comfortable. We were pleased to be on a floor near where we requested. Additionally, our room had a nice view of the street. Despite the location on the street, the walls were covered in material that enhanced sound proofing from the street. We slept quite well. The bath was well appointed. In-room coffee was also provided. There are electrical outlets on either side of the bed which are super convenient. The lighting throughout the property was very good. The location is ideal .Friendly staff very cooperative & smiling. Special thanks for Mr Amadieo & Mrs Habi. Staff were very friendly and helpful, especially the (Italian? )gentleman at the front desk. A fantastic location, close to Nice Ville railway station but also within 10 mins walk of the sea and old town. Very friendly staff, nice clean room. Very quiet considering you are on the main street going into town (Avenue Jean Medicin). Location is very good. Just short walk to train station and around center. Room s is pretty small, but comfortable. Breakfast was very nice and breakfast room was very inviting. People who on front destroy at day time was wonderful, very polite and very helpful. 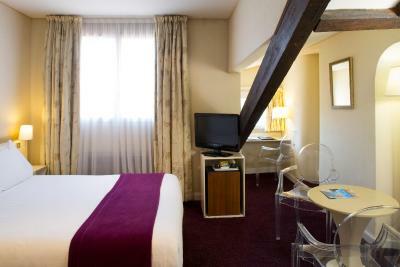 Best Western Alba is in the heart of Nice, on the avenue Jean Medecin shopping street. 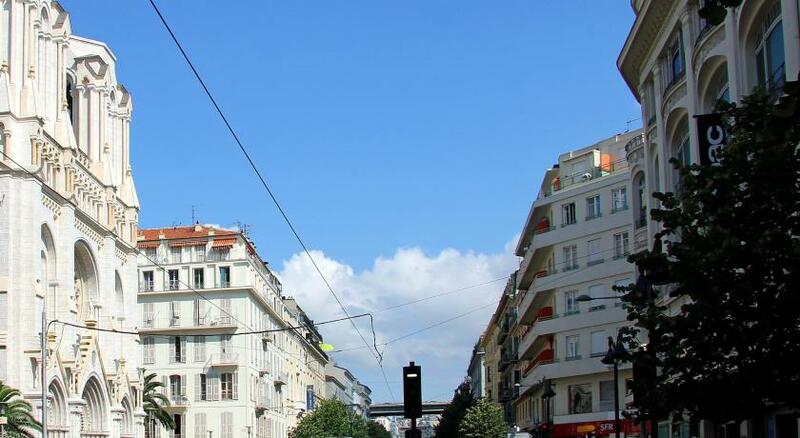 Just a 15-minute walk from the beaches of the Promenade des Anglais and a 3-minute walk from the shopping center Nice Etoile, it has spacious accommodations with free Wi-Fi. 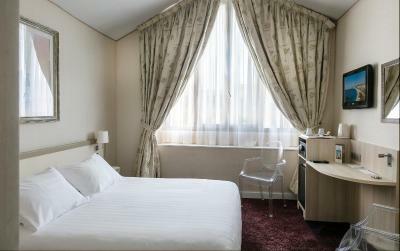 Each of the soundproof guest rooms have air conditioning, a flat-screen TV with satellite channels, and tea and coffee-making facilities. Best Western Alba provides a 24-hour front desk and a daily buffet breakfast can be enjoyed in the breakfast room. 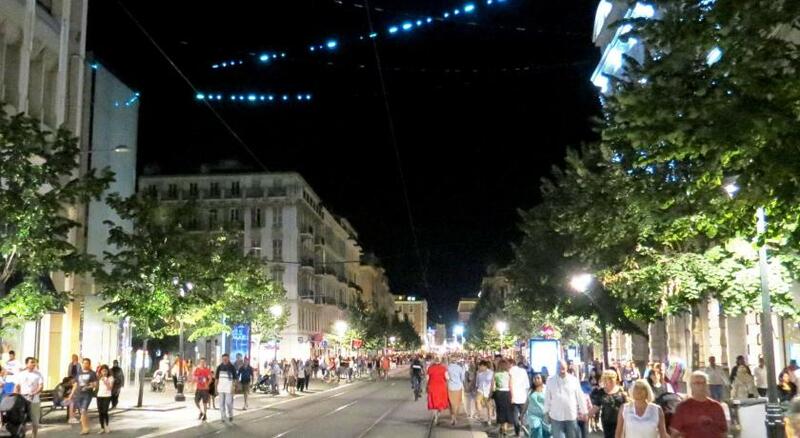 The Nice Acropolis Convention Centre is just under 1 miles away and Nice-Ville Train Station is 950 feet away, which provides services to nearby towns, such as Monaco and Cannes. 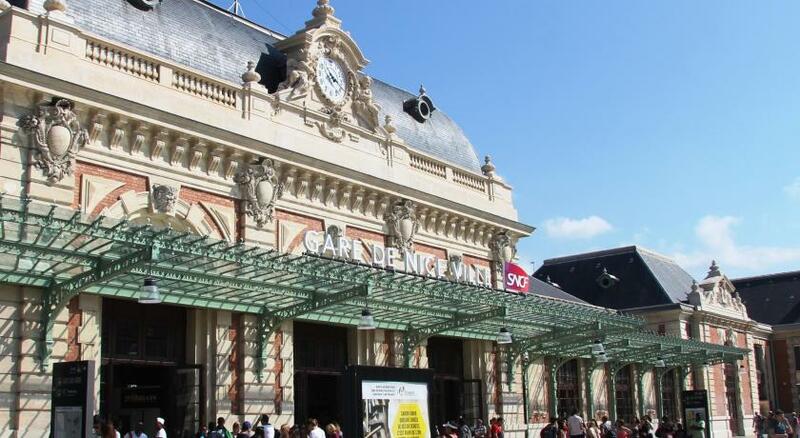 Guests can also take the shuttle bus to the airport from the station and a tram stop is a 2-minute walk away. When would you like to stay at Best Western Alba? This twin room has a mini-bar, electric kettle and flat-screen TV. This triple room has a electric kettle, air conditioning and soundproofing. This single room has a electric kettle, satellite TV and air conditioning. House Rules Best Western Alba takes special requests – add in the next step! Best Western Alba accepts these cards and reserves the right to temporarily hold an amount prior to arrival. 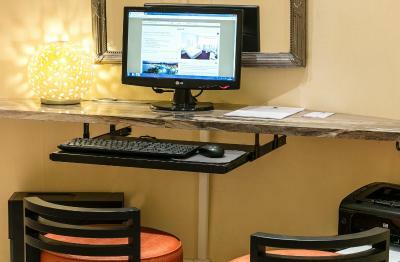 For nonrefundable rates, guests will receive a link to a secured site for payment upon reservation. Please note that the breakfast room will be closed for renovations from 11 to 15 February 2019. During this time, breakfast will be served in the guest rooms for no extra charge. Nothing really. There could have been more comfortable seating in the reception area but it wasn't a problem. good location on main street, easy walk to station. I had a room at the back of the building which was extremely quiet even with the window open at night. Room was large with very comfortable bed. Breakfast was good with plenty of choice. A good hotel for the centre of Nice. Excellent bed and pillows! You can find everything you need in breakfast: fruits, bread, cereals, yoghurts, fresh juices, sausage, ham, cheese, croissants, different kind of coffees etc.. Hotel also located next to main street. Old town and promenade anglais in a walking distance. Two nights in a room that seems like a service room. The cleaness cars parking next to my door and the noise after 6:00 am. This noise became in the next room that is the breakfast room and for that i have paid near 180 euros. Staff are very friendly and helpful. Public car parks within walking distance. It was my 2nd stay at BW Alba and I enjoyed it again. Great location, close to the train station and the beach. Many cafes, restaurants and shops. Very friendly and welcoming staff. There was good coffee-machine in the room, but we asked for an electric kettle, and we were given it. The room was a good size with comfortable beds. Good value for money in low season. The breakfast was good but there wasn't vegetables. 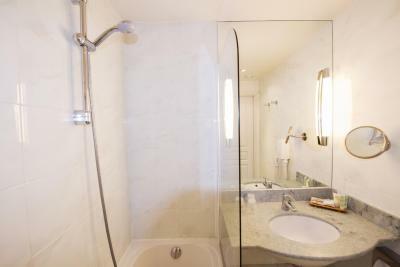 Perfect location- next to the train station, in the heart of the center. 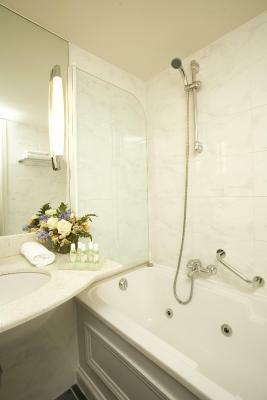 The staff was very polite, the room was cozy and the bed was extremely comfortable. The height of the bathroom was less than 2m. I'm almost 1.9m and when I was taking a shower (only bathtub) I had to tilt my head sideways to fit in. We had 2 or 3 occasions of bad smell (like sewage) coming from the ventilation. I'm not sure if it was connected but it appeared after flushing the toilet. Great location, very friendly and helpful staff. The room was very clean. Although that the hotel is on the central steet our room was overlooking over an inner court and it was very quiet. Very convenience. Easy to travel everywhere. Love the place. 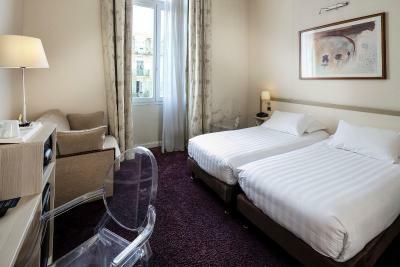 Excellent location - next to The Basilica of Notre-Dame. The room was clean and warm. The WI-FI was good. Breakfast was very good except having both eggs & sausages in the same hot plate isn’t very good for veggies so couldn’t have any hot food for breakfast except toast. 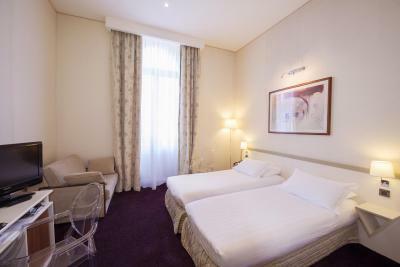 Excellent hotel, very clean & staff very nice, location is perfect for exploring both Nice & the rest of France as it is less than 5 min walk to the train station.